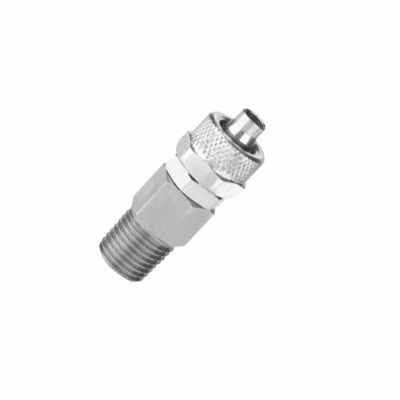 The PNEUFLEX rapid fittings series are available in different shapes (studs, elbows, T), with threads Gas taper (BSPT) and Gas parallel (BSP). They can withstand air pressures higher than the tube's maximum, up to 2.0 MPa. They can operate on temperatures ranging from -20 °C to 120 °C, are recommendable for safer applications. They are mostly used for connection of tubes made from nylon, polyethylene, polyurethane and rilsan. Tube tolerances are ± 0.05 mm (from ø 4 mm to 10 mm) and ± 0.1 mm (from ø 12 mm to 15 mm). They are made out of nickel-plated brass (body and nut), with FKM O-rings, and washers in acetal resin (if provided). Nickel plated brass threaded bodies and locking nut provide corrosion and contamination resistance. The locking nut provided can be tightened by hand or with a wrench. The special shape of the ID cone protects the tubing from accidental damage.